Has your vanilla ice cream been tasting different lately? Japanese researchers have succeeded in making the sweet smell of vanilla come out of the last thing people could imagine — cow dung. In a world-first recycling project, a one-hour heating and pressuring process allows cow feces to produce vanillin, the main component of the vanilla-bean extract, according to researcher Mayu Yamamoto. The vanillin extracted from the feces could be used in products such as shampoo and aromatic candles but not in food, said Yamamoto, who works for the Research Institute of the state-run International Medical Center of Japan. Compared with usual vanilla, “this component is exactly the same but it would be difficult for people to accept it in food, given the recent rules of disclosing the origins of ingredients,” she said. December 8, 2006 Posted by oldstersview | Uncategorized	| Comments Off on Has your vanilla ice cream been tasting different lately? Thousands of people dressed as Santa Claus took part today in an annual “Santa Dash” in the English city of Liverpool, setting a new world record in the process, organisers of the event said. 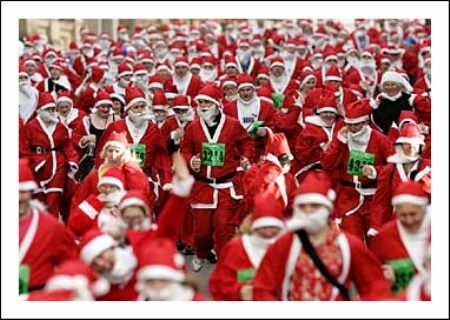 To raise money for local charities, about 5000 people dressed up in red suits, white beards and black boots and ran for five kilometres through the streets. The feat dwarfed last year’s event which saw the northwestern city earn a place in the Guinness Book of Records for the most Santas in one place at one time with 3921. Though more than 5000 people filled in applications to enter the 2006 event, the exact number of runners, along with the total amount raised, has not yet been confirmed. Wonder how many needles it still has on it? A Wiltshire family have used the same Christmas tree for 120 years. Janet Parker’s foot-high tree is listed in the Guinness Book of Records. 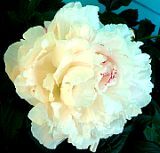 It was given to her by her Aunt Lou in the 1940s, reports the Sun. When the tree was bought in 1886 It cost six old pence (2.5p). December 8, 2006 Posted by oldstersview | Uncategorized	| Comments Off on Wonder how many needles it still has on it?